Although forgotten today, Frank McQuade was a figure well-known to New Yorkers of the Jazz Age. Among other things, McQuade was a highly visible Manhattan magistrate, an influential Tammany Hall operative, and widely regarded as “the father of Sunday baseball in New York.”1 He was also a peripheral target and/or government witness in various municipal corruption investigations. But the lion’s share of the considerable newsprint that McQuade garnered during his lifetime was generated by his stormy tenure as minority owner and club treasurer of the New York Giants. 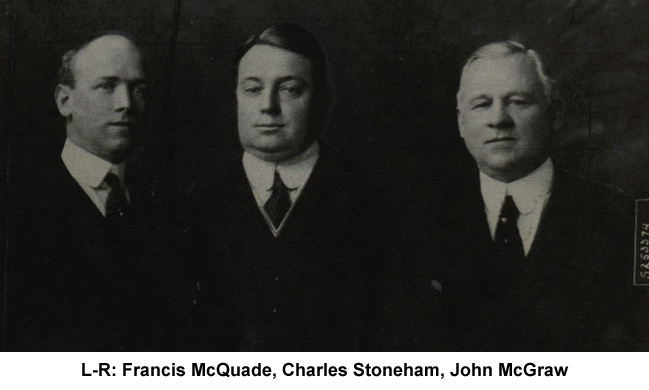 In May 1928 his ouster from the treasurer’s post by principal club owner Charles Stoneham touched off years of litigation, with often tawdry in-court revelations leaving McQuade, Stoneham, and Giants manager John McGraw considerably diminished in public esteem. In the end, McQuade lost his lawsuit against the Giants and spent the final two decades of his long life mostly out of the limelight. Francis Xavier McQuade was born on Staten Island on August 11, 1878, one of 12 children born to Irish-Catholic immigrant Arthur J. McQuade (1845-1909) and his wife, Ellen (née Tuite, 1850-1928), a native of New York.2 Brought to America with family as a child, the adult Arthur became well-to-do running the unchic but lucrative Manhattan rag and junk business started by his father, Thomas McQuade. As a result, Arthur’s children were raised in comfort. But not without the embarrassment attending their father’s arrest and imprisonment in the late 1880s. Although the McQuade clan had its share of athletes – uncle Barney (Bernard) McQuade had been a world-class handball player in the 1880s and cousin Jim McQuade was an outstanding World War I-era pitcher at Fordham College – the playing of sports is conspicuously absent from the resume of Frank McQuade.7 Still, McQuade, like many Tammany members, was a close follower of major-league baseball and an ardent fan of the New York Giants.8 Given that, and a shared fondness for alcohol, racetracks, and Manhattan nightlife, it was only a matter of time before McQuade and Giants manager John McGraw found each other. Another thing that the two had in common was a predilection for using their fists, particularly after heavy drinking. But unlike the small-but-pugnacious McGraw (who took his lumps more often than not in fights), the unimposing Frank McQuade, 5-feet-8, slightly built, and prematurely bald, was a fearsome brawler and a man to be avoided in a melee. Much alike, the two feisty Irishmen quickly became fast friends. In the months that followed and notwithstanding separation-of-powers niceties, Judge McQuade dove into the legislative arena, openly and actively campaigning for the repeal of the law prohibiting Sunday baseball. He spoke out forcefully to the press whenever the opportunity presented itself. He lobbied state senators and representatives in Albany.12 He even enlisted the support of ex-President (and former New York City Police Commissioner) Theodore Roosevelt.13 All to good effect. On April 19, 1919, a bill sponsored by State Senator (later New York Mayor) James J. Walker sanctioning Sunday baseball was signed into law by Governor Al Smith, both Tammany pals of McQuade. Overnight, telegrams of congratulations by the hundreds were dispatched to McQuade, while newspapers nationwide described the adoption of the Sunday baseball bill as “a great personal triumph” for him.14 Three weeks later, a throng of more than 35,000 was on hand at the Polo Grounds to see McQuade throw the ceremonial first pitch in the inaugural Sunday major-league game played in New York (which, unfortunately for the home side, the Giants lost to Philadelphia, 4-3). Finally, on May 24, 1919, more than 1,000 friends and admirers attended a testimonial dinner at the Commodore Hotel in Manhattan to honor McQuade for his efforts on behalf of Sunday baseball. The toastmaster, New York State Supreme Court Justice Victor J. Dowling, extolled the new law, calling its passage “a long step forward in the furtherance of personal liberty in this city.”15 McQuade was then presented with a diamond ring and the pen that Governor Smith had used to sign the Sunday baseball bill into law.16 All things considered, it may well have been the happiest evening of Frank McQuade’s life. The elevation of McGraw to club executive rank was a shrewd move by Stoneham. It guaranteed that baseball’s most astute manager would remain in the Giants dugout indefinitely, while simultaneously gratifying a long-held McGraw ambition to move into the club’s front office. But what prompted Stoneham to embrace McQuade, apart from perhaps shoring up support on the political front, is indiscernible, particularly given that civil servant McQuade was not a rich man and required a loan from Stoneham to finance his purchase of club stock. Joining the Giants syndicate and accepting the $7,500-a-year salary paid the club treasurer also required McQuade to disregard the strictures of a New York judiciary statute that expressly prohibited a city magistrate from engaging in any other paid occupation or profession.22 He would act as a city court judge and New York Giants corporate official simultaneously – a course that would go unchallenged for a decade but ultimately cost McQuade dearly. In the short run, the syndicate arrangement worked to everyone’s satisfaction. Stoneham reaped the benefits of a revitalized franchise, successful on the field while setting new league attendance records. With unfettered access to the ample Stoneham checkbook, McGraw rebuilt the Giants into the winner of four consecutive NL pennants (1921 to 1924) and captured World Series crowns the first two years. But perhaps happiest of all was Frank McQuade, who reveled in his association with the club. He invariably accompanied the players to spring training, cavorted merrily both on and off the field, and, unexpectedly, developed into a club spokesman, a task that Stoneham, for all his notoriety,23 preferred to avoid, and one for which manager McGraw often had no time. In September 1923 a far graver crisis confronted the club leadership: Stoneham’s indictment by a federal grand jury on fraud charges related to his stock-trading ventures. After a trial marred by acrimonious exchanges between the trial judge and prosecutors and allegations of jury tampering, Stoneham was acquitted. But ensuing civil suits by defrauded investors against the accused and the legal expenses incurred from continually needing to defend himself strained Stoneham’s finances, and put the brakes on the free spending that had allowed McGraw to build a championship team in the early years of the Giants syndicate. The change in club financial fortunes agreed with neither McGraw nor McQuade, and added to the growing animosity among the syndicate principals. In the forthcoming battle with his syndicate partners, McQuade soon had an important ally. Sometime during the summer, New York construction magnate (and Tammany Hall buddy) William F. Kenny acquired the Giants stock held by the estate of the now-deceased Arthur Soden, becoming the club’s second largest individual share owner.30 Months thereafter, Kenny instituted litigation on behalf of minority Giants shareholders seeking an accounting of some $410,000 in club funds disbursed to Stoneham from 1919 to 1926. The Kenny action was widely seen as having been instigated by McQuade,31 and Stoneham responded with a lawsuit of his own, seeking $250,000 damages from McQuade for damaging the business reputation of the Giants corporation, disclosure of club secrets, harassment of club employees, and assault, the latter charge being grounded in a punch by McQuade that shattered the eyeglasses of Leo Bondy.32 McQuade was hardly cowed, immediately filing an affidavit that detailed a plethora of dubious club disbursements to Stoneham, some of which were then passed along to McGraw.33 Stoneham did not deny receiving the money, but insisted that the club treasury had long since been repaid, with interest. From there, things only got worse for Frank McQuade. Soon, the Seabury Investigations Committee, the Tammany scourge that would later drive Mayor Walker from office and effect the dismissal of numerous New York City magistrates, began inquiring into McQuade’s conduct. Committee investigators found no corruption, but nonetheless recommended McQuade’s removal from the bench “for personal conduct and business and other activities which demonstrate his unfitness to continue to serve as a city magistrate.”36 On the morning set for McQuade to appear before the committee, he resigned from the bench, his formal letter of resignation declaring that he had come “to the conclusion that it was illegal for him to serve as a city magistrate and at the same time serve as an officer of the New York baseball club.”37 McQuade also deemed resignation necessary to protect his interest in the Giants, as he did not want to see Stoneham and McGraw escape liability from the still-pending McQuade lawsuit “on a technicality.”38 For its part, the committee saw no need for further proceedings against McQuade and promptly moved on to bigger fish. After preliminary skirmishing, McQuade’s lawsuit finally came to trial before Justice Philip J. McCook of the New York State Supreme Court in December 1931.39 The linchpin of the action was a proviso in the original syndicate agreement that required Stoneham, McGraw, and McQuade to “use their best efforts for the purpose of continuing [each other] as officers” of the Giants club. Obviously, McQuade asserted, his ouster as club treasurer by board directors appointed and serving entirely at Stoneham’s pleasure [or “Stoneham dummies,” as McQuade called them] contravened that proviso. In failing health during his last years, Frank McQuade died at his home in Manhattan on April 6, 1955. He was 78. Following funeral services, his remains were interred in Calvary Cemetery in Queens, New York. Survivors included his long-estranged wife, Lucille (to whom the deceased left a bequest of $1),56 his son, Arthur, and daughters, Helen Egan and Lucille Muir. The biographical data provided herein has been culled from US Censuses, McQuade family info posted on Ancestry.com, and certain of the newspaper articles cited below. Information about the political and baseball life of Frank McQuade has been taken from contemporary reportage, particularly that of the New York Times. 1 So described in the opening line of his obituary in the New York Times, April 7, 1955, and elsewhere. 2 The other McQuade children were Mary Ann (born 1871), Ellen (1872), Thomas (1874), Elizabeth (Bessie, 1875), Arthur (1876), Sarah (1877), Benjamin and John (1880), Raymond (1881), Philip (1882), and Harold (Harry, 1886). Four of the McQuade children, however, did not survive infancy. 3 Note that prior to 1898, New York City consisted only of Manhattan and adjoining parts of the West Bronx. 4 Relief was granted Arthur on the basis of a rather strained, hypertechnical reading of the New York jury impaneling statute. See People v. McQuade, 110 N.Y. 284 (1888). The McQuade decision was poorly received by judicial observers and denounced on many newspaper editorial pages. See, e.g., the Boston Advertiser, October 5, 1888, Chicago Tribune, October 6, 1888, New York Herald, October 12, 1888, and San Francisco Chronicle, October 14, 1888. 5 The last will and testament of Arthur J. McQuade, with September 28, 1908, codicil, is viewable on line via Ancestry.com. Frank was left a $20,000 bequest by his father. 6 First tabbed to fill a vacancy in 1911 and thereafter appointed to a full 10-year term by Major William J. Gaynor in 1912, McQuade was reappointed to a second 10-year tem by Mayor John F. Hylan in July 1921. Perhaps needless to say, both Gaynor and Hylan were Tammany stalwarts. 7 The only reference discovered by the writer to Frank McQuade ever playing any kind of ball is contained in a thank-you letter from an ailing Christy Mathewson that stated: “Little did I suspect, when you were my catcher down in Marlin (the Giants spring training spot) years ago, that one day you, as a big league magnate would be voting to have your club give me a testimonial game.” See Letter of Mathewson to Francis X. McQuade, dated December 13, 1921, on file at the Giamatti Research Center in Cooperstown. 8 Although New York Highlanders/Yankees owners Frank Farrell and Bill Devery (and later Jacob Ruppert) were Tammany heavyweights, Sachem men tended to be fans of the Giants, the club founded by Tammany Brave John B. Day back in 1883. 9 New York blue laws banning the playing of sports, selling alcohol, and the like had been on the books continuously since 1695. 10 As reported in the New York Times, Tampa Tribune, and Washington Evening Star, August 22, 1917. 11 See Editorial Comment, Baseball Magazine, Vol. 19, No. 6 (September 1917). Because constitutional protections against double jeopardy prohibit government appeal of a wrongful acquittal, the McQuade ruling was insulated from review and reversal by an appellate court. 12 As reported in the Washington Evening Star, January 29, 1918, Philadelphia Inquirer, December 5, 1918, and elsewhere. 13 As per the Augusta (Georgia) Chronicle, April 8, 1918. 14 See, e.g., the Flint (Michigan) Journal, April 26, 1919, Lexington (Kentucky) Herald, April 27, 1919, (Cheyenne) Wyoming State Tribune, April 30, 1919, and (Baton Rouge) State Times Advocate, May 12, 1919. Almost all of these news articles featured a photo of McQuade, as well. 15 As per the New York Times, May 25, 1919. Scheduled to speak, Governor Smith was obliged to send his regrets, but Senator Walker, Tammany boss Charles F. Murphy, and Giants manager McGraw were among the dignitaries in attendance at the McQuade testimonial. 17 Omaha World-Herald, August 17, 1938. 18 According to Frank Graham, The New York Giants: An Informal History of a Great Baseball Club (New York: Putnam, 1952), 107-108. 19 The writer was unable to find a definitive purchase price in contemporary news accounts of the Giants sale, with most guesstimates offering the $1 million figure. See, e.g., the Chicago Tribune and New York Times, January 15, 1919. But a recent Giants history put a $1.3 million price tag on the sale of the club. See Tom Schott and Nick Peters, The Giants Encyclopedia (Champaign, Illinois: Sports Publishing, Inc., 1999), 90. 20 McQuade assumed the treasurer post formerly filled by Ashley Lloyd, while John B. Foster held over as club secretary until McGraw, who disliked Foster, arranged his removal. 21 As specified in the decision of the New York Court of Appeals in McQuade v. Stoneham, 263 N.Y. 323, 189 N.E. 234 (1934). 22 The Inferior Courts Act, NY Laws of 1910, ch. 659. 23 Charles Stoneham did not court press or public attention but seemed incapable of eluding it. Long before he entered the baseball world, cutthroat business practices and a scandalous personal life had made Stoneham a familiar figure to readers of the financial and gossip pages of New York dailies. 24 The Hempstead overture was first reported in the New York Sun, October 14, 1922, and thereafter in the New York Times, October 26, 1922, and The Sporting News, November 2, 1922. 25 See The Sporting News, November 23, 1922. 26 After Hempstead, those reportedly approaching Stoneham about selling his Giants stock included former Yankees co-owner Til Huston, boxing promoter Tex Rickard, circus impresario John Ringling, New York construction magnate William F. Kenny, the Madison Square Garden corporation, and bricklayers boss J. Henry McNally. 30 As belatedly reported in the New York Times and by Associated Press wire, December 28, 1928. 31 As reported in various AP outlets. See, e.g., the Macon (Georgia) Telegraph and New Orleans Times-Picayune, November 14, 1929. 32 As per the Chicago Tribune, New York Times, and various AP outlets, December 25, 1929. 33 As summarized in the Omaha World-Herald and Springfield (Massachusetts) Republican, December 27, 1929, and specifically detailed in the New York Times, January 7, 1930. 34 The minority shareholders suit instituted by William F. Kenny appears to have gone dormant after Kenny lost interest in the Giants and sold his club stock in August 1930. In any event, its disposition was undiscovered by the writer, who presumes that the suit was eventually dismissed for lack of prosecution. The same outcome is likely regarding the Stoneham lawsuit against McQuade, its allegations having been subsumed into the defense of the suit subsequently instituted by McQuade against Stoneham and McGraw. 35 As reported in the New York Times and various AP outlets, July 2, 1930. 36 As per the New York Times, December 10, 1930. 39 Despite the appellation, the New York State Supreme Court is a trial-level tribunal. The state’s court of final resort is the New York Court of Appeals. 40 Space limitations preclude an accounting of the personal and business iniquities of Charles Stoneham. Still, it would have been interesting if counsel had inquired into the two separate wives (Johanna Stoneham in Jersey City and Margaret Stoneham in Westchester County) who, unbeknownst to each other, each identified Stoneham as her husband to 1930 US Census takers. 41 As reported in the New York Times, December 18, 19, and 22, 1931. See also, the Chicago Tribune and San Diego Evening Tribune, December 22, 1931. 42 As reported in the New York Times and AP outlets nationwide, December 23, 1931. 43 As reported in the New York Times, Rockford (Illinois) Morning Star, and elsewhere, January 13, 1932. 44 See the New York Times, March 18, 1933. 45 McQuade’s lengthy service as a city magistrate qualified him for a pension, but the law required McQuade to be in city employ on the date that he put his retirement papers in. 46 See the New York Times, December 15, 1933. 47 As reported the Aberdeen (South Dakota) News, Biloxi (Mississippi) Herald, Trenton Evening Times, and newspapers across the country, February 21, 1934. 48 As noted in the New York Times, March 1, 1934. 49 According to McQuade’s obituary in the New York Times, April 7, 1955. Stoneham died of Bright’s disease in January 1936, leaving control of the New York Giants to his son Horace. 50 McQuade v. Stoneham, above. 51 Id., at 263 N.Y. 329. 53 As reported in the New York Times, June 11, 1935. 54 As reported in the New Orleans Times-Picayune, Springfield Republican, and elsewhere, June 27, 1938. 55 New York Times, January 31, 1953. See also Westbrook Pegler, “Dempsey Fight Story Finally Ripened,” Boston American, February 3, 1953. 56 As per the New York Times, May 13, 1955, and Boston American, May 14, 1955.